What’s for sale in May? The calendar says April 30th but Mother Nature disagrees! What an unusually cold and snowy April we’ve had. But this is the opening week of the market! Wednesday May 2nd and Saturday May 5th are our first market days of the season. What does a cold spring mean for the market? What can you expect us to have for sale in May? Many of our vendors have product that isn’t really affected by the weather. 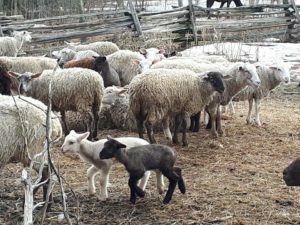 Braelea Acres and Russett Farms have had extra work on their plates at the farm this month, keeping their spring calves and lambs warm and dry, but they’ll still have lots of lamb, pork, and beef for sale. 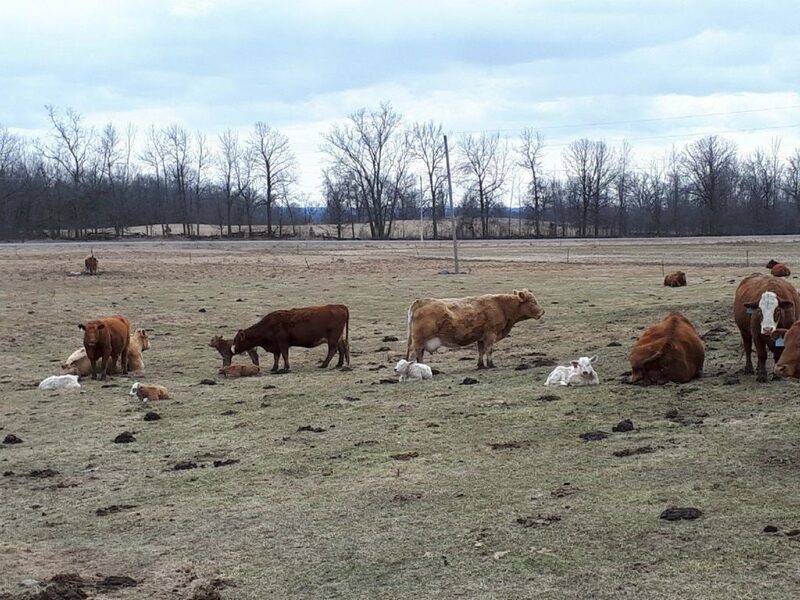 We’re also excited to welcome new vendor Healey Falls Bison Farms (starting on May 12th) who will have delicious, grass fed, bison meat products to try. Cold weather doesn’t keep our home bakers out of the kitchen. They will have tables piled high with sweet treats! A2 Baking Creations will have all their old favourites (butter tarts, cookies, pies, mini pies, and chocolate cream cheese muffins) and they’re expanding to include some new offerings. I can’t wait to see what they bring! The Philosopher’s Scone will be back too. I love to see the different scone varieties that Val comes up with each week. Maple Bacon and Cranberry White Chocolate were two of my favourites last year! On Wednesdays we’re also happy to have Anita Barker of Anita’s Creations join us. 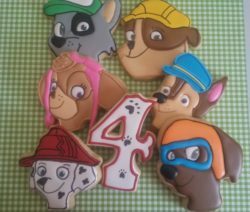 Anita makes beautifully decorated cookies for all occasions. 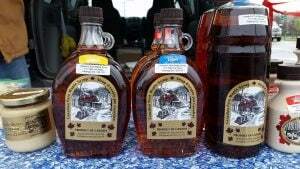 Howson’s Pure Maple Syrup and Honey are just coming off a terrific spring for maple syrup making. They’ve got some great photos on their Facebook page of their first batch of syrup on February 25th, right up until their last batch on April 14th. What about vegetables? 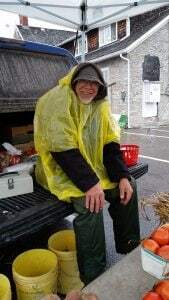 Many of our produce vendors get a head start on the season with all manner of season extension techniques – indoor seed starting under lights, heated greenhouses, unheated tunnels, cold frames etc. They also know what plants grow well in the cold, which varieties come to maturity quickly, and what vegetables do well to be harvested young. So you’ll see baby salad mixes and radishes before you know it. And don’t forget about sprouts and microgreens from Glenlea Farm! 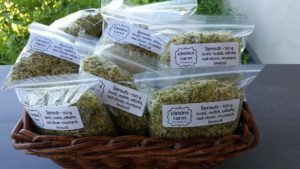 I’ll have a big batch of Zesty Mixed Sprouts and another of Sunflower Micro-greens, both ready for Saturday. Most established vegetable growers have also taken the time to grow perennial plants that produce food early in the season. You can always count on Lost Road Gardens for rhubarb and asparagus, and Vokes Farms has lovely early perennial bunching onions. May is also the month that you start to see plants for sale at the market. Evegroen Gardens and Rainbow Terrace will have lots of vegetable, herb, and perennial plants for sale. 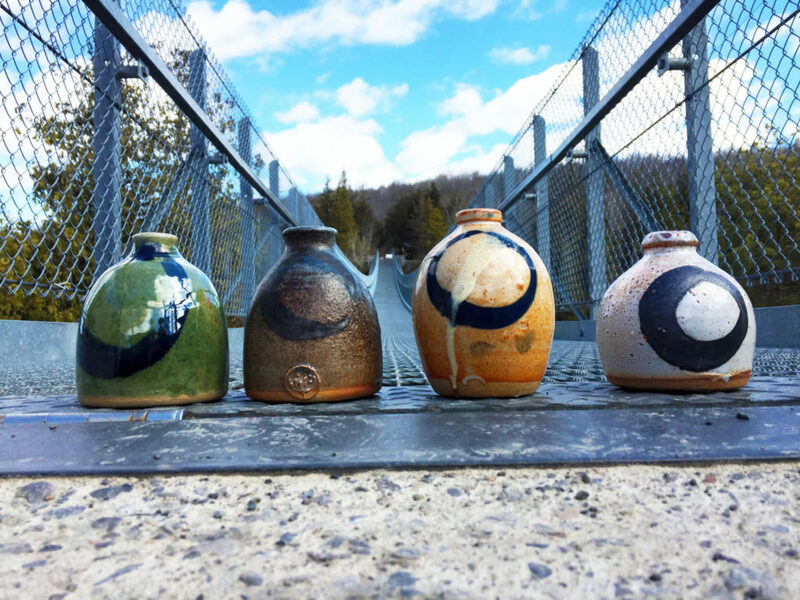 The multi-talented Chandra Rice will knock your socks off with her beautiful ceramics, fabric art, and more! Don’t forget to ask about her local workshops. Have you ever heard of fluid art? Lynn Carnrite of Auntie Hoss’s Fluid Art will have some of her fascinating pieces for sale. New vendor Melly Rolls will take care of your snacking needs. Homemade sushi and pastries?!! We are so excited! Cuppa will be brewing up coffee, tea and hot chocolate for you to sip on while you stroll through the stalls. Word on the street, is that they have a sweet new stall design – you’ve got to see it! Don’t forget to bring your bicycle on Saturday. 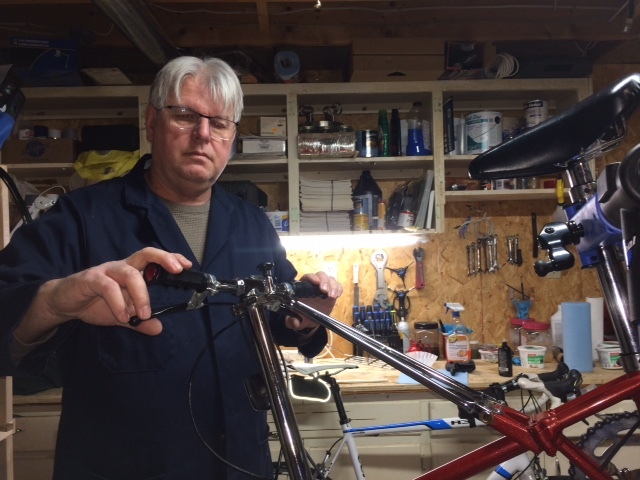 Guest vendor Dale McIlmoyl of Campbellford Bicycle Repair will bring the tools, supplies, and know-how to make minor bike repairs on site. His rates are reasonable. He wants to get you and your bike back on the road! For more involved repairs, arrangements can be made with Dale to get your bike into his repair shop. 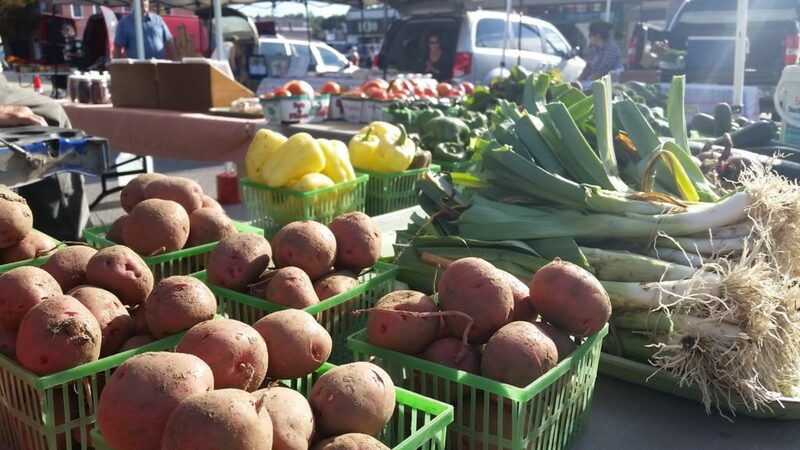 Despite this cold spring, Wednesday or Saturday, there’s lots to see and do at the market. We really look forward to seeing you! Nothing seems to have changed during the last 15 years. It is still the big guys who monopolize the market at the expense of the small producers who surround the huge stalls. They merely serve as a backdrop to the retailers, giving the market the appearance of authenticity. The customers are conned into believing that they purchase fresh produce directly from “genuine” farmers, and at a lower price than at the local supermarket – which is not necessarily the case. While this kind of “market” may be a tourist attraction, it is, other than that, of no benefit to the local economy. I would go so far as to say that they are an unfair competition to established supermarkets. Little overhead, no property taxes, minimal use of utilities. The result of this “formula” is that it condones the lucrative and virtually risk-free practice of retailing fruits and vegetables purchased at wholesale outlets, e.g. the Toronto Food Terminal. With negligible overhead (no store, next to no rent, no taxes, a guaranteed customer base) the resellers easily outsell the bona-fide producers and make a lot more money, too. The sad advice is that customers at farmers markets must learn to be suspicious, ask questions, and listen to the answer. There is more to a farmer than a pair of overalls and a big hat. The other option is a true “producers’ market where a direct exchange of goods and money between customers and local growers/producers takes place. The customers know for sure that they purchase “untraveled”, in-season fruit and vegetables. They can ask questions and receive knowledgeable answers. They can enquire about ingredients in baked and canned goods. They can even visit the vendors at their farms. More often than not, customers and vendors become good friends. This kind of a market is a true tourist attraction and a community event. The benefits to the local economy are measurable in positive terms. Producers compete against each other in terms of quality and creativity, hardly ever in price or quantity. This means that a true producers’ market, in comparison to the “outdoor supermarket” delivers a much higher standard in the quality of goods for sale. Admittedly there are health risks in purchasing perishable items in an outdoor environment. However, I believe that “long-distance” produce, even if it has been treated with all kinds of chemicals against fungus and harmful bacteria, is vastly more risky than fresh, untreated, local fruits and veggies. This brings us to the Campbellford Farmers’ Market, one of the few true farmers’ markets in eastern Ontario. If you have not yet visited us, you missed a lot. We are open from May 1 to October 31, every Wednesday and Saturday, from 8:00 am to 12:00 pm. You will enjoy the atmosphere, the buskers, and all the good things straight from our farms, gardens, and kitchens. The birds are chirping, the days are getting longer, and our produce growers can see the rhubarb coming back to life. 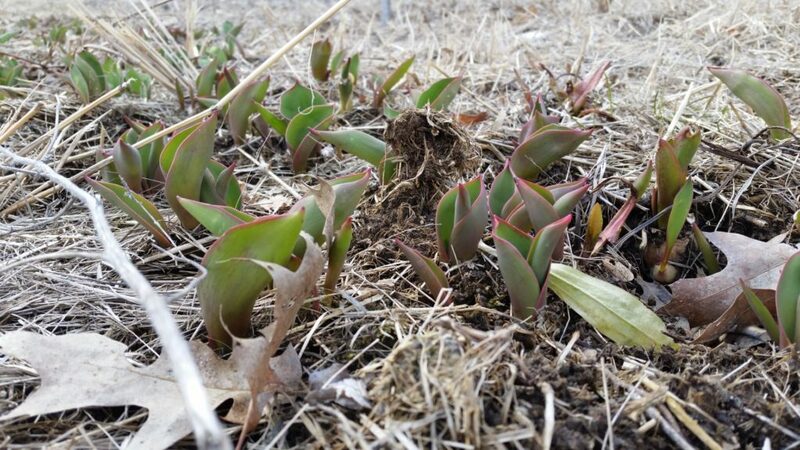 In my cut flower garden at Glenlea Farm, the tulips and daffodils are starting to poke their heads out of the soil. Wayne and Will at Howson’s Pure Maple Syrup and Honey have been busy at work in the maple sugar shack. At Rainbow Terrace Greenhouse and Garden, the greenhouse is toasty warm and baby plants are well on their way to being ready for your home. Calving season has started at Russett Farms. Warmer weather means healthier calves, so the Russetts time all their calving to take place in the spring. Sandra reports they’ve got 16 calves right now and two more on the way soon. At Braelea Acres it’s lambing time! Hope says that most of their lambs are born from February to April. They welcomed 2 more babies yesterday! The days are still chilly, but winter is clearly behind us now. Spring is a time of new beginnings at the market too. The members of our market management team have been hard at work this winter planning a fantastic market season. We’ve been recruiting and booking musicians, planning special events, and vetting new farm and artisan vendors. We’ve also been working on our advertising strategy for the year which includes this exciting new website! Our Facebook page has been an effective tool for sharing information about upcoming events and happenings at the market, but not all our customers use social media and we wanted a more substantial web presence. We’ve decided to include this blog component to our website, which will (if you choose to sign up) be delivered to your email inbox regularly, like a newsletter. Here we hope to include information about upcoming events, reports on market happenings, seasonal recipes, opinion pieces, education pieces, and as always, colourful photos to feast your eyes upon! We are so lucky in Campbellford to be well supported by the community – citizens, other businesses, and the municipality. We hope that this website will help us to communicate with our customers and continue to grow and thrive. Our first Wednesday and Saturday markets for 2018 are Wednesday May 2nd and Saturday May 5th. Please peruse the vendor profiles on our website for details about who will be attending the market this year. And if you haven’t already, we’d love you to sign up for our newsletter so that we can keep you up to date with our goings-on. Happy spring everyone! We look forward to seeing you at the market soon!